When inspected closely, the back of a phorid fly will appear to have a humped shape. Phorid flies tend to fly and walk in an erratic pattern, rather than in a predictable straight line. Phorid flies are often seen walking along a surface, rather than flying. Unlike most flies, which take flight when escaping, phorid flies may attempt to run away. Phorid flies often appear around dead animals, such as rodents. 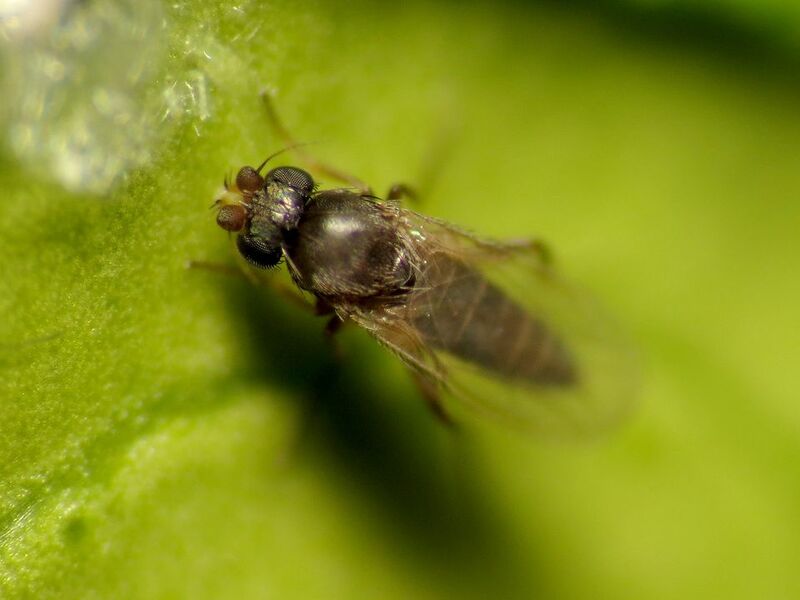 While at a casual glance, phorid flies can be mistaken for fruit flies and drain flies, close inspection will reveal that they don't have the red eyes found in fruit flies, nor are they attracted to vinegar—one of the key identifying traits of fruit flies. Nor do phorid flies have the fuzzy, moth-like bodies found on drain flies. And drain flies, since they prefer damp, dark locations are almost always found near sink or floor drains—not usually the preferred location for phorid flies. Phorid flies include many species of tiny flies within the Phoridae family. About 4,000 individual species fall under the common name of phorid fly. Usually about 1/8 inch long, phorid flies typically have a hump on the back and are most notably identified by the habit of running away on surfaces rather than flying—a behavior that is responsible for the other common name for this insect—the scuttle fly. Egg-to-adult reproduction occurs in about 25 days. This fly may transmit disease-causing organisms, so it should be controlled when spotted. Phorid flies are often spotted when there is dead, decaying mouse, rat, or another animal in or beneath the home, and they can also appear when there are hygiene problems with pets. Even an underground break in a sewer line, which may be largely invisible and undetectable, may cause an infestation of phorid flies that can come up through the floor. However, phorid flies prefer dead animals to other forms of organic material, and where phorid flies are seen, there is a very good chance of finding a dead, decaying rodent, bird, or bat hidden somewhere in the walls or floors. Phorid flies are often the first pest drawn to these corpses, followed by other scavenger insects, such as carpet beetles, mites, and other flies. It is wise to begin looking at the first appearance of phorid flies before the corpse can begin emitting an unpleasant smell. The best solution for a phorid fly infestation is to locate and eliminate the animal corpse or decaying organic material that the flies are using to feed and breed. When combatting mice or rats, the use of rodent bait poisons should be avoided, since this often causes rats and mice to die inside walls or below floors, where the decaying corpses create a haven for phorid flies. When rodents are a problem, use traps so the rodents can be removed from the home. If you have phorid flies coming up from drains, have your sewer system inspected for breaks. Flush floor drains, and fixture drains frequently and copiously to eliminate organic material. Keep garbage disposals clean, as well. Bleach flushed through drains will kill fly larvae. Make sure to keep kitchens and bathrooms spotless, especially floor areas around the bottoms of appliances and fixtures. Clean up fastidiously after pets. Once breeding/feeding sources have been eliminated, adult flies can be combated with a contact spray containing pyrethrins. Bug lights ("zappers") will also attract and kill adult phorid flies. However, if the flies have not disappeared within a week, it is likely that you have not yet found and eliminated the organic feeding/breeding source.